Wine in it's essence was created to be drunk with food. Not so you'd be drunk, but rather to be consumed. Wine comes from cultures where food is considered part of a national or regional identity and over time, wine has come to be wrapped up in that experience. It compliments or completes a meal. Wine certainly can be appreciated on it's own, without food, but at the end of the day, wine is in many ways, food itself. wine doesn't pair with football, this is dumb. You know what wine isn't? Wine isn't made to pair with "Monday Night Football" or "post Zumba" or Halloween. However there is no end to the kinds of insanity you'll see in various online wine publications or "personalities." I was actually asked the other day via Twitter, "Hey @clivity what wine pairs with Monday Night Football?" My response, what's for dinner? There is no football wine. Because a wine has a "spooky" label that doesn't make it a Halloween wine, if you're going to talk Halloween wine, do it properly, pair it with what you eat on Halloween. My man Jameson Fink did that very thing for Serious Eats. These are wines without "spooky" labels and cheesy marketing that you can totally drink with sweet desserts or candy, check that out here. Today's Friday Find is a wine made for food pairing, the Pescaia from Facelli Winery in Woodinville. Facelli is probably one of the least talked about wineries in Woodinville and point of fact, that's a damn shame. They make really nice wines, and represent a small family operation that has been at it for a long time. 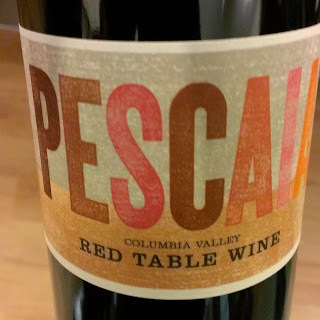 Their Pescaia is a fantastic NV, or Non-vintage blend at the $20 price point. That is to say, the wines that are blended to make it are done so across varying vintages. This can often lead to some really fantastic wine at a very low price. This wine falls into that category. The blend of Barbera, Syrah, Cabernet Sauvignon and Sangiovese balances great food friendly acids along with a mix of red and dark fruit for a really great food wine. It will stand up to hearty sauces, but also do well with some grilled fish. I'm thinking cioppino is calling this wine's name. You get ample bright fruits from the Barbera, red currant and cranberry as well as some nice cedar and dark plum courtesy of the Cabernet to balance the wine out. Bring this wine as a dinner guest and you're going to make a lot of people happy. As for where you can find it, the good people at Bin 41 in West Seattle carry it and I encourage you to go by Facelli out in Woodinville and try their other wines. I've long been a fan of their Merlot. Clive, thanks for the post. Glad you enjoyed the Pescaia. Your timing couldn't be better, our holiday sale just started here at the winery. I agree, Cioppino, Baguette, Pescaia....Finito!! Thanks for reading Lou. Really appreciated that wine, it's been to long since I've been out your way. I'll say hello next time I'm in the neighborhood.